Consumers, and especially dieters, will tell you that navigating food labels can be a nightmare. Deciphering food claims can be daunting. Understanding ingredient lists is nearly impossible. Trying to identify additives and preservatives requires a PhD. But a new food website and food app aims to make food information simple to digest. “Ask the Sage Project” aims to help consumers really understand the food choices they make. The website shows you a food choice, say strawberries (brand name specific), and floats simple pieces of information – calories per serving, number of ingredients, how many badges (indicating positive food attributes) it has, whether it’s a good source of nutrients, whether it’s a good value at the price for the level of nutrition it provides, whether it contains specific allergens, and the specific nutrients it provides. You can navigate the site to look up a food by brand category or by product filter. But the website and app go way beyond that. The website was developed in response to observations made by triathlete Sam Slover, co-founder and chief executive of Sage. He’d studied the food landscape that consumers have to navigate daily. Food labels assume we know a lot and can interact with a standard food label in a way that allows us to make informed decisions. But there’s so much information on the label, often in tiny print, it’s nearly impossible to truly know what you’re eating much of the time. Food labels can also trick you into believing a food is healthy when it’s not. Consumers need clarity and this app aims to provide that. The Sage app offers useful and unusual information on some 20,000 food products. It also gets “very diet specific,” so you can create a diet or identify foods that correlate to your dietary preferences. 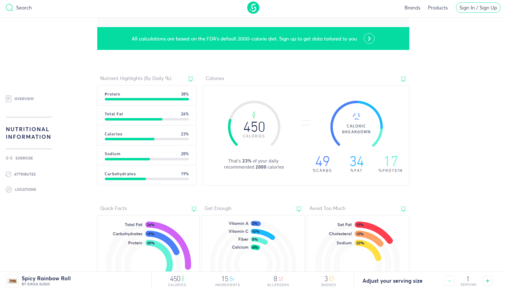 A portion of food will be framed as “percentage of total daily calories.” If you are really into shopping healthy, then its partnership with Whole Foods means you have access to 7,000 items sold in the new 365 chain rolling out nationwide. The app will try to identify even more preferences in terms of nutrient value (are you looking for specific vitamins and minerals), no added sugar, a short list of ingredients (clean label), high protein, etc. Once I loaded this information, clicking on the “products page” showed foods that fit my personal dietary settings. Above each food was a clear indication of the criteria the food meets. 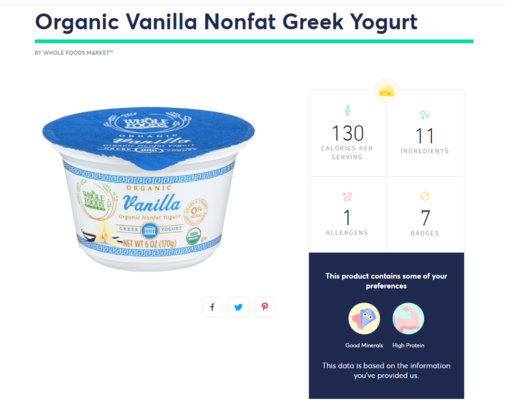 For example, the app showed me that a single cup serving of Whole Foods brand vanilla non-fat yogurt has 110 calories, 11 ingredients, seven badges including probiotics, is a good source of minerals, high in protein, is kosher, gluten-free, vegetarian and pescatarian-friendly, fat free, bone healthy, and has low sodium. It is considered five percent of my total daily calories, and one serving is made up of 50 percent carbs, zero fat and 50 percent protein. It is also rich in vitamins A and C, with 20 percent of my daily calcium needs. I would have to do 10 minutes of biking, or 16 minutes of dancing, or 32 minutes of yoga, or seven minutes of running, or seven minutes of jumping jacks, or 10 minutes of swimming to burn off the calories from this food. All of the exercise information is provided by animated food figures – adorable!